Brett Favre looked tired and felt even worse late Sunday afternoon as he stood at a lectern inside the Metrodome. "I'm worn out," he said. "Believe me, I could fall [over] right now." The San Francisco 49ers did not have nearly the success against Adrian Peterson on Sunday that they did two years ago, when they held the Pro Bowl running back to a career-low 3 yards on 14 carries. 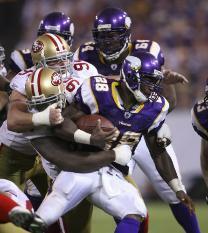 But the 49ers still fared better than most, as Peterson rushed for 85 yards on 19 carries with no touchdowns. Take away a 35-yard run in the first quarter and his totals drop to 50 yards on 18 rushes in the Vikings' 27-24 victory.